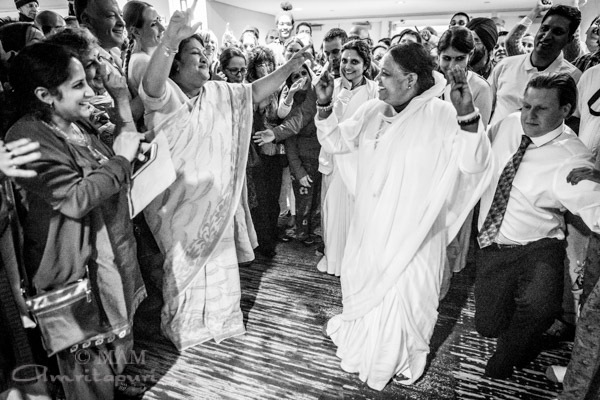 Amma held two days of public programs followed by a Retreat and Devi Bhava at the Detroit Marriott Hotel at the Renaissance Center in Detroit. 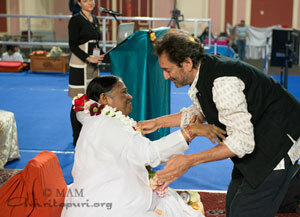 The first evening program ended at 3:30am with Amma dancing to a traditional Baduga melody. 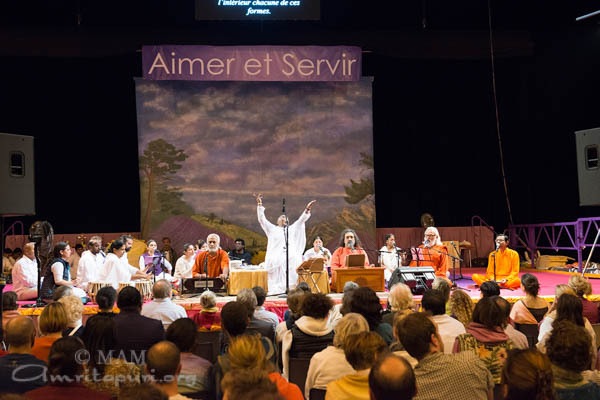 At the end of the second full day program, Amma sang “Aya He Sahara Jagam” and, just before leaving the stage, danced once again to the delight of everyone. 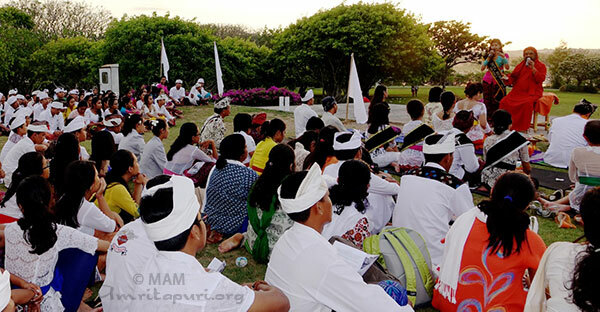 During the retreat, regional satsangs presented various dance performances, one of which sang the praises of Lord Ganesh. 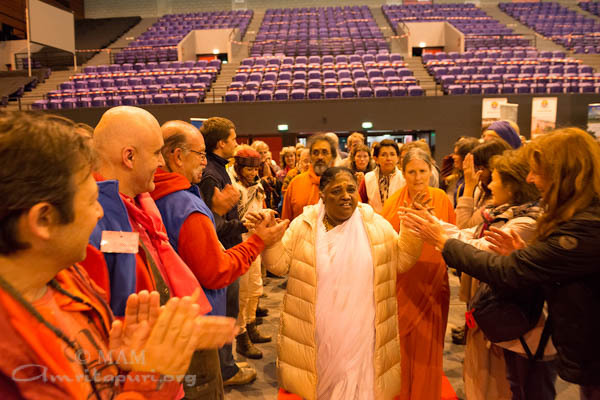 Another group performed a traditional Hebrew dance to a song which included the sanskrit prayer ‘Lokah Samastah Sukino Bhavantu’. 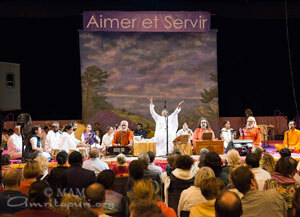 Children from the regional balakendra also sang and performed traditional Indian dances. 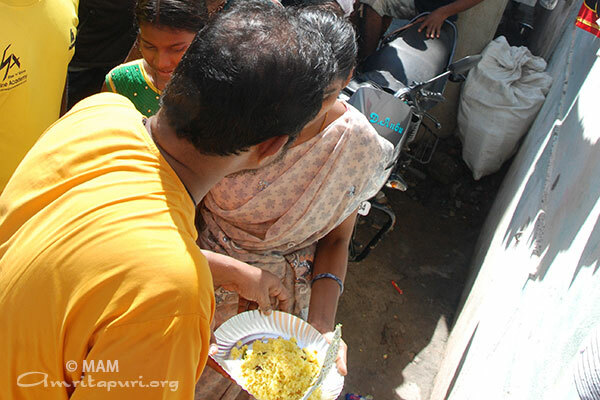 A light dusting of snow fell overnight and on the day off, many children ventured outside in the cold breeze to gather what snow they could to make snow balls. 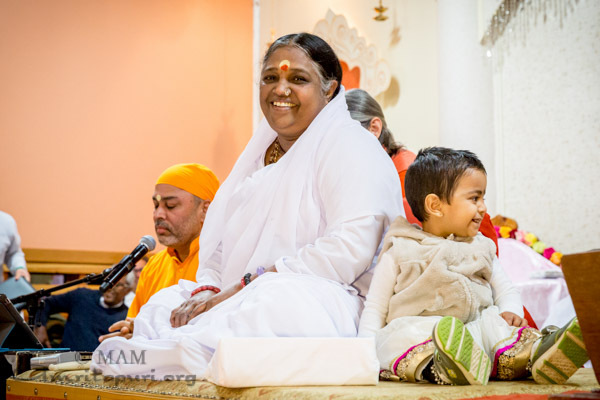 On the final evening, more than 50 children sat on stage near Amma as she led everyone in the Atma Puja ceremony for World Peace. 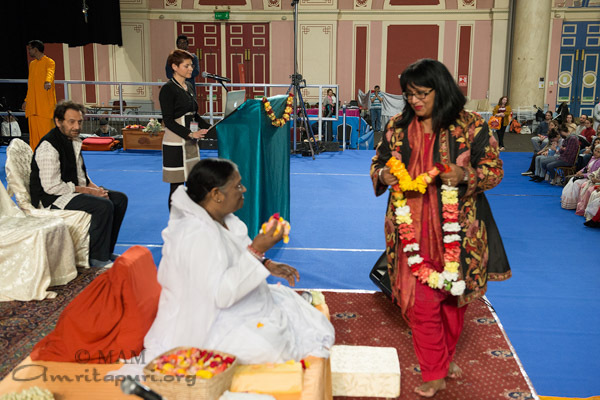 Amma wore a beautiful soft pink lavender and sky blue sari for Devi Bhava. 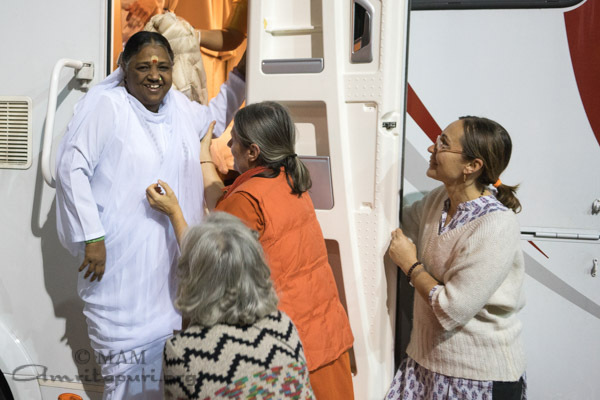 The programs ended just after 8am the next day when Amma left the stage and departed for her return flight to Amritapuri. 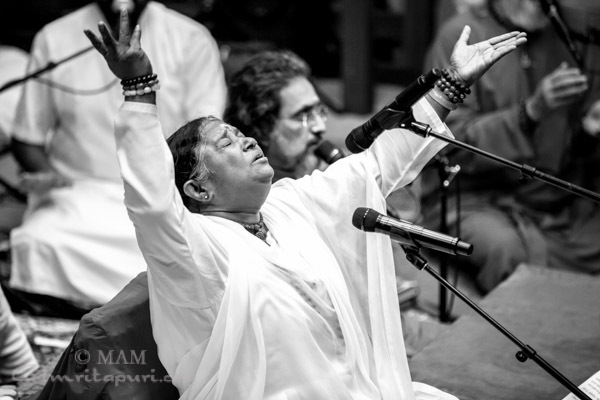 She will be giving Darshan from 2Dec till BharataYatra starts early next year. 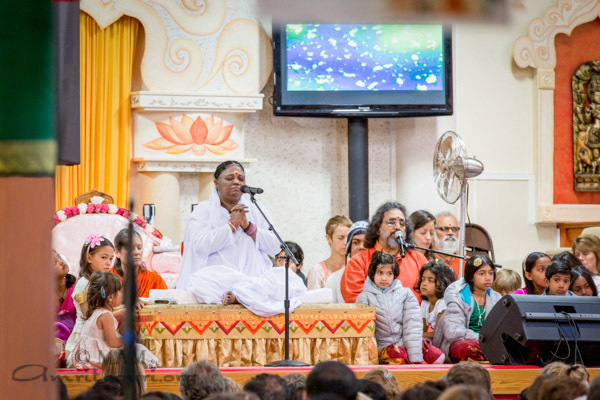 Amrita University has been ranked among the top 200 universities in BRICS (Brazil, Russia, India, China, South Africa) countries by reputed international ranking organization QS (Quacquarelli Symonds). 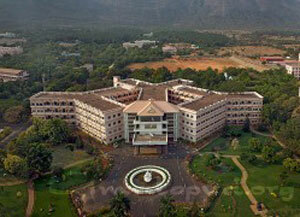 Amrita is ranked ahead of many well known established universities. 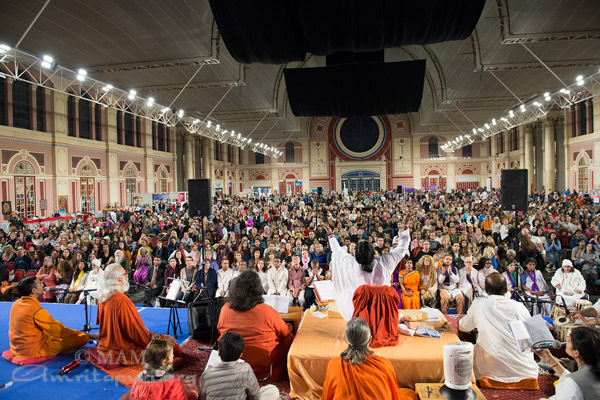 QS has been bringing out the World University Rankings, which is regarded as one of the most influential and coveted university rankings in the world. 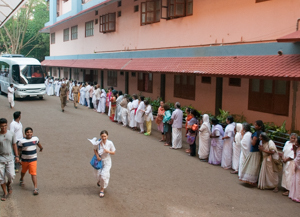 QS was developed to track the relative progress of leading universities in BRICS countries. 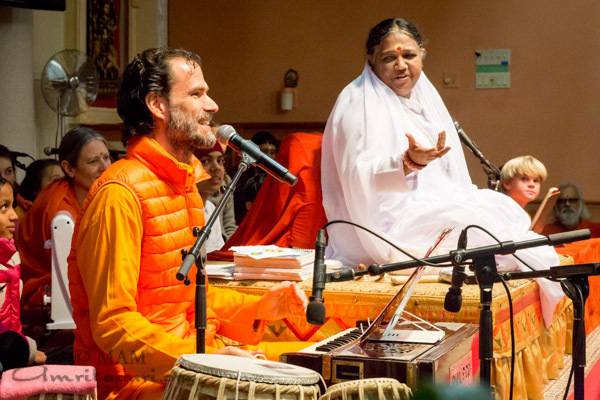 This ranking is based on eight key performance indicators relating to global reputation, employability, internationalization, faculty quality and research output & impact. 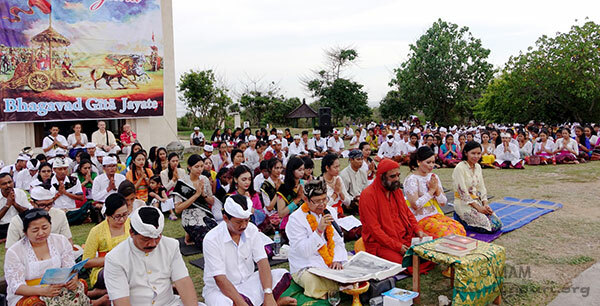 Swami Purnamritananda led a Bhagavad Gita event in Badung Regency in Bali. 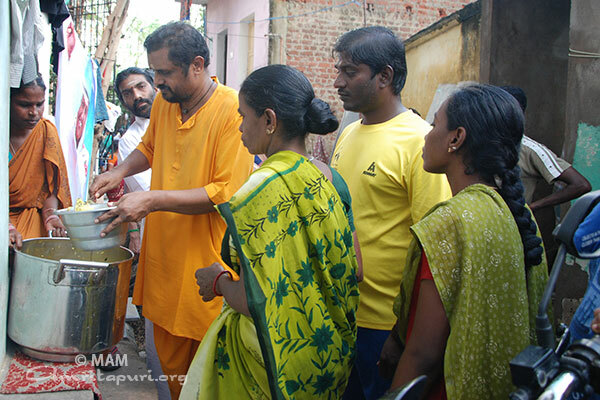 Swamiji was welcomed by Prabhu Darmayasa from the Paramadhama Ashram, and Senator Arya Wedakarna. 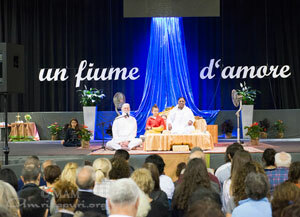 There were talks on the Gita, cultural performances, and singing. 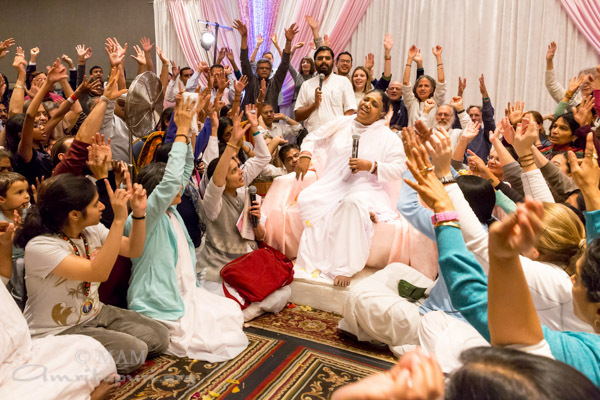 Attendees also chanted the 12th Chapter of the Bhagavad Gita, after which everyone participated in a meditation session held at the beach. 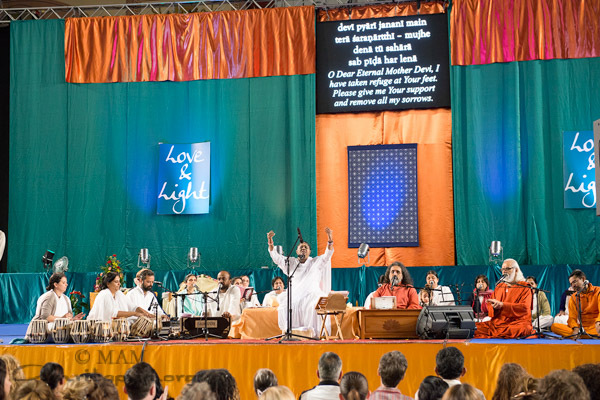 Swami’s beautiful flute music filled the air as the sun set during the meditation. 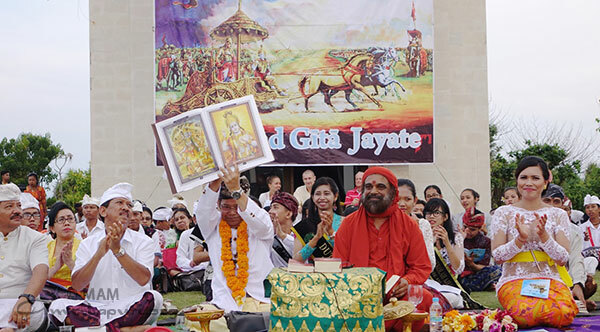 The event also included the signing of a declaration recommending that all a copy of the Bhagavad Gita be placed in each hotel room in Bali and that the Gita become part of the standard school curriculum. 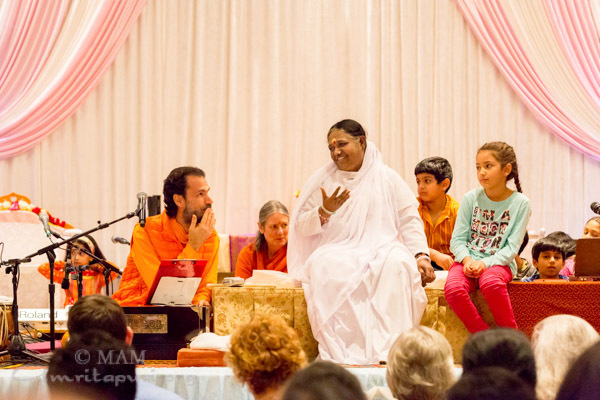 Amma held two days of public programs followed by a Retreat and Devi Bhava at her San Ramon Ashram in California. 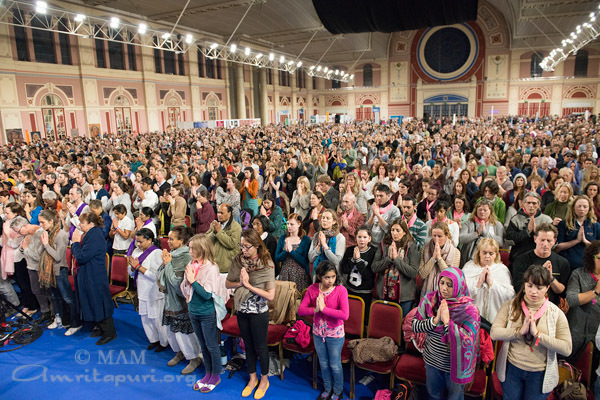 Amma began the programs by asking the assembled crowd to sit in silence and pray for the peace of those who lost their lives in the terrorist attacks in Paris and in Lebanon, and for those who have been devastated by the sudden loss of their loved ones. 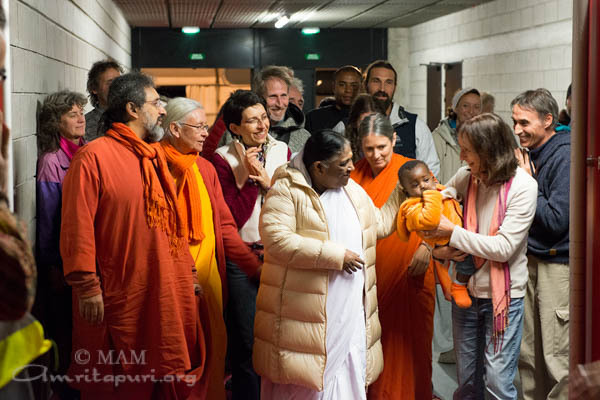 She has also called upon all her admirers in Paris and the surrounding area to donate blood for the surviving victims. 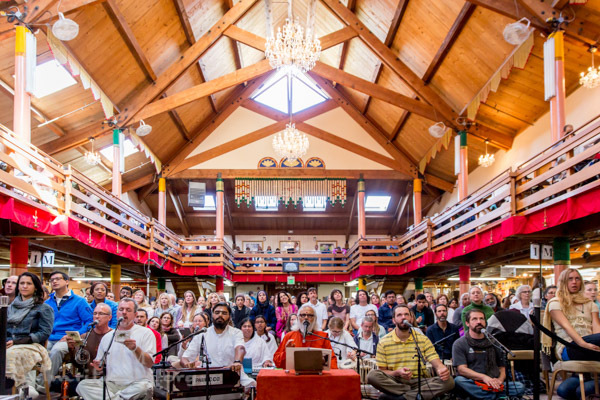 Satsang groups from around the San Francisco Bay Area sang bhajans throughout the afternoon on the first day which went from 11am for 13 hours continuously. 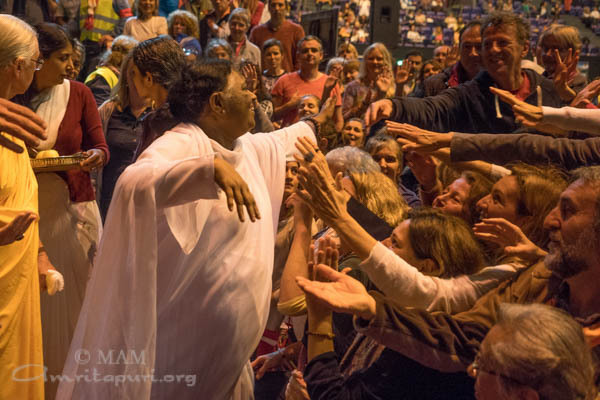 At the end, Amma sang Aya He Sahara and, as Amma has been doing throughout the European Tour, she enthralled the crowd by gracefully dancing to a traditional Baduga melody. 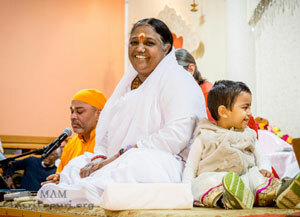 Rain began just after Amma left the hall and continued overnight, ending just before the morning programs were to begin. 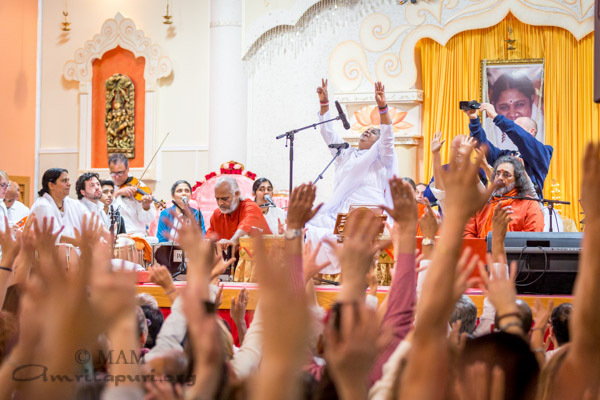 The second day fell on a Sunday with both a morning and evening program. In the evening, Br. 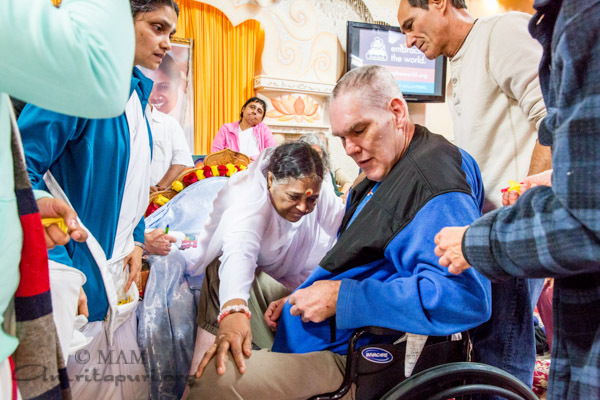 Dayamrita gave satang followed by Amma’s bhajans and darshan. 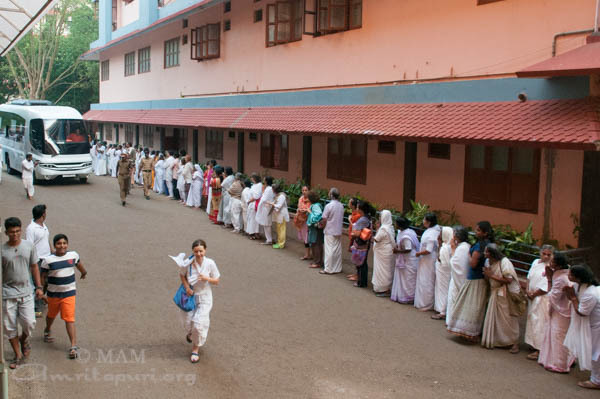 During the evening program, Amma gave instructions for the railings along the balcony to be painted the same color as the columns in the hall. 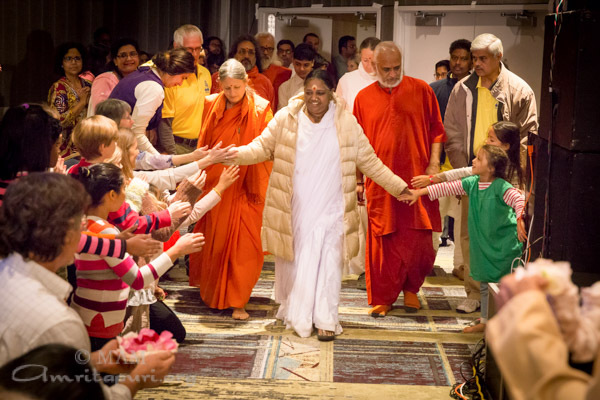 Immediately after Amma finished darshan, preparations began. 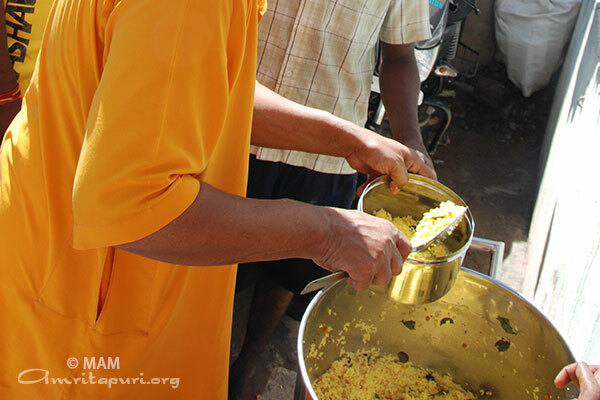 Devotees worked from early morning through lunch laying tarp, taping off edges, and painting. 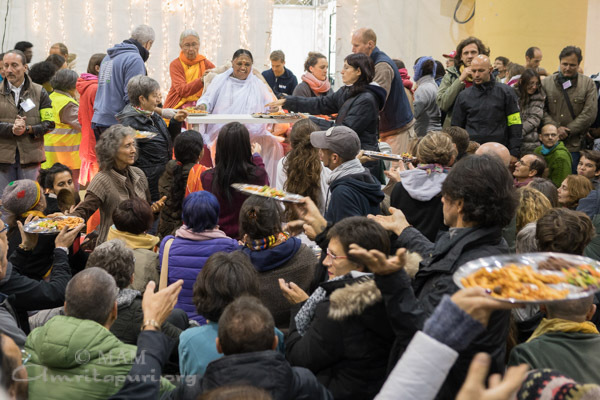 Few dozens of people eagerly joined in this special seva and work was finished by mid-afternoon – giving plenty of time for the paint to dry before the first evening retreat program began. 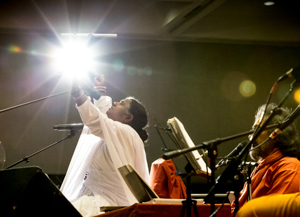 A number of cultural programs were performed during the retreat. A string trio entertained the gathered crowd with selections from Handel’s Water Music. 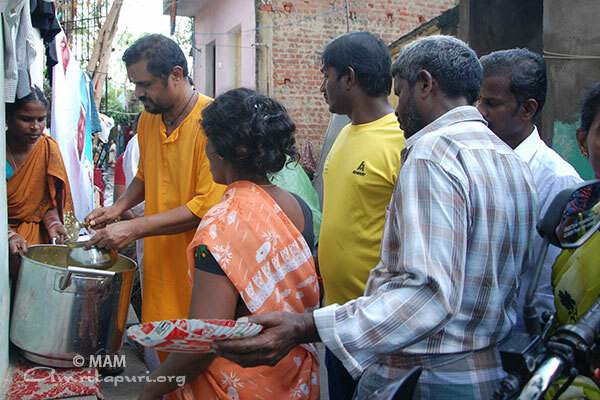 They were followed by local devotees dancing to one of Amma’s new bhajans – Mariamma (Samayapurattale). 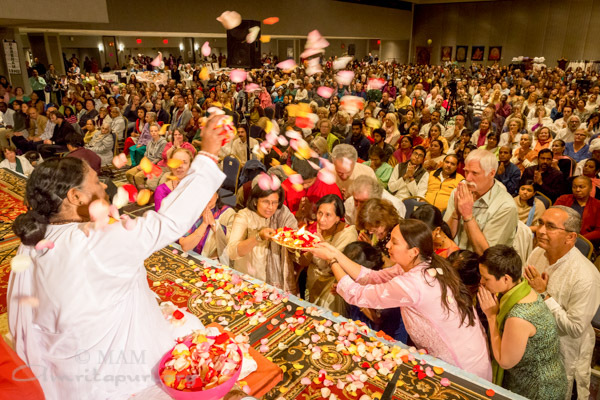 The beautifully choreographed steps embodied the words of the bhajan which praise Devi. 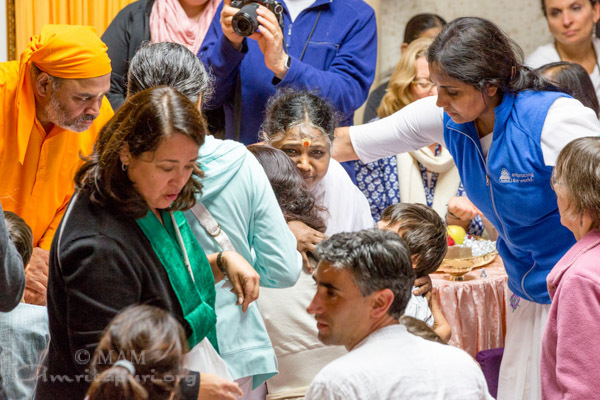 Throughout the programs, Amma’s Greenfriends Farm had a table just outside the Snackshop where they sold delicious fresh fruits, dried apples and persimmons, and jams made with fruits grown in Amma’s Orchard at San Ramon. 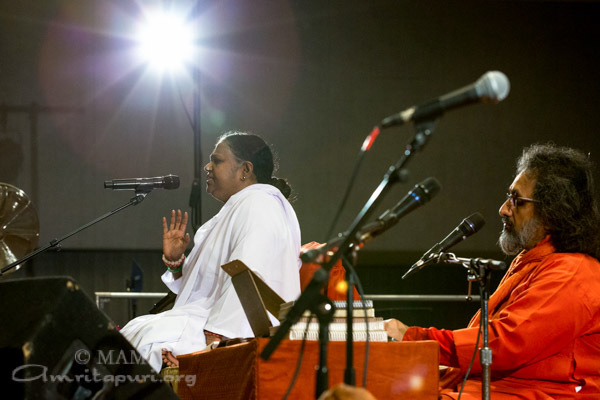 Amma wore a beautiful purple sari for Devi Bhava. 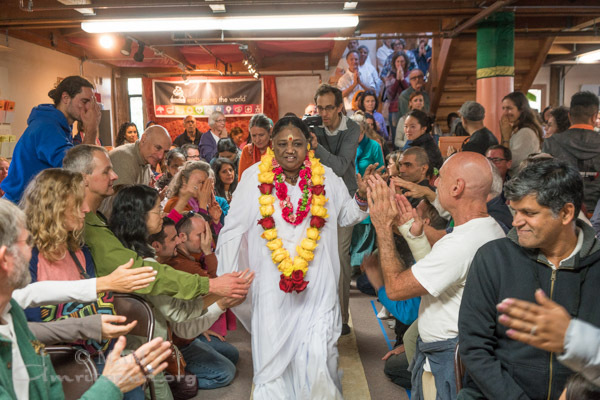 Devi Bhava ended at approx. 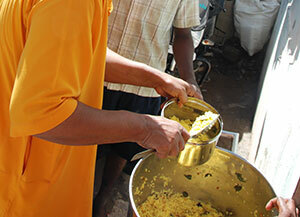 8:30am the next day. 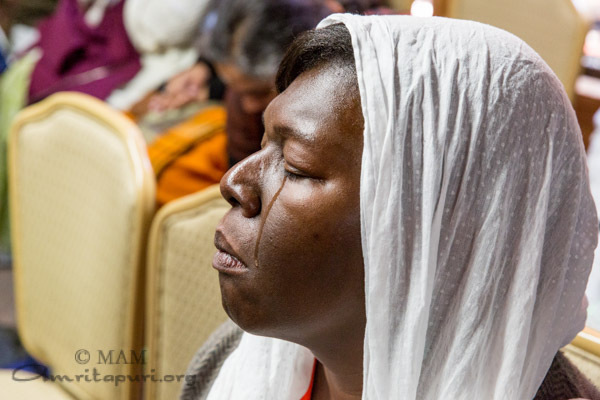 Everyone rested before heading to the airport to catch their flights to the next program Detroit. 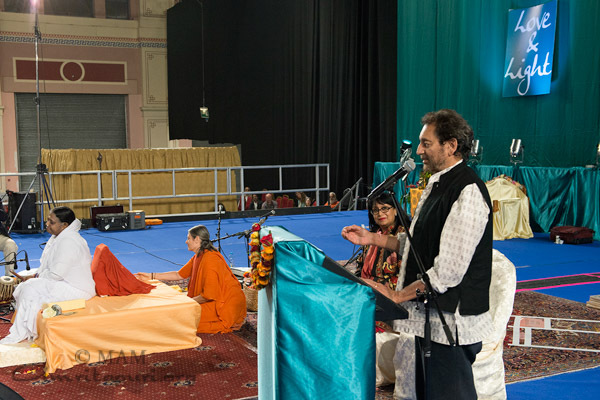 It was a beautiful Diwali gift for Amma’s children in the United Kingdom as she arrived at the Alexandra Palace for a two-day programme held on November 10 and 11, 2015. 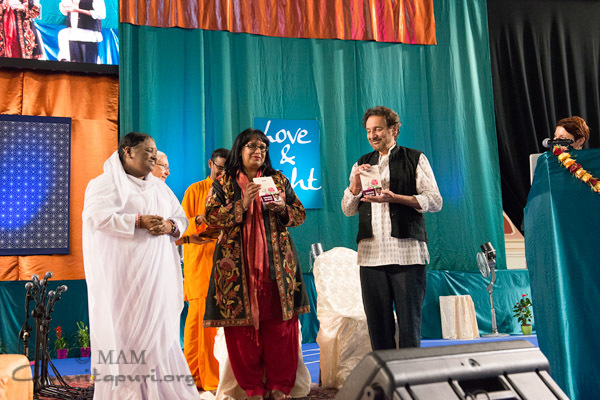 Baroness Verma also released the first copy of the English version of the book; “Amma’s Pearls of Wisdom” which is a collection of Amma’s beautiful quotes for 365 days in a year and handed over the first copy of the book to Shekhar Kapur. 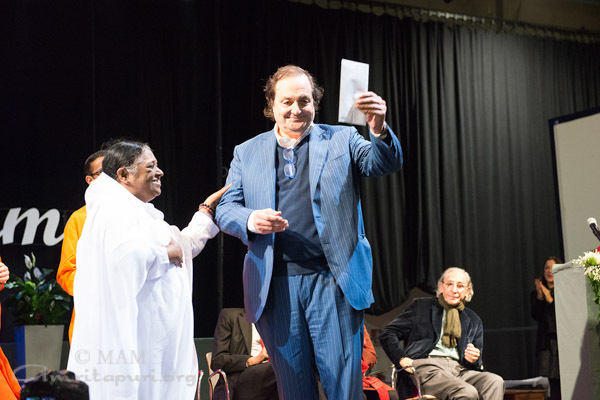 The Ambassador of Mexico to the United Kingdom, Diego Gomez Pickering, was also present on the occassion and also invited Amma to visit Mexico. 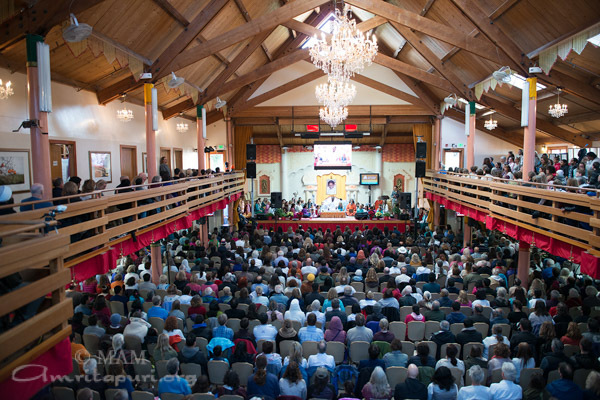 Devotees thronged the venue from all parts of the United Kingdom on both the program days. 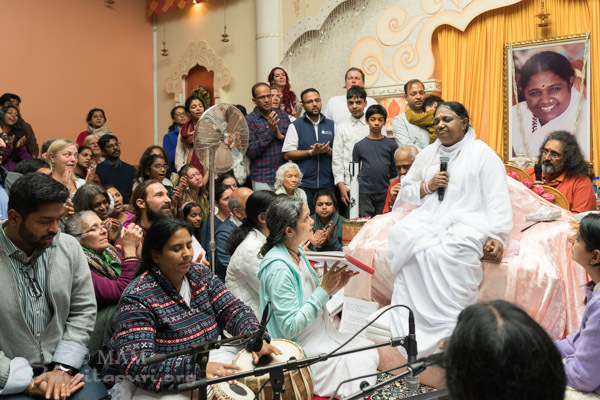 During Amma’s darshans, there was a whole range of cultural programs ranging from Indian classical music, Taiko drumming from Japan, Western classical to pop music, which really added to the celebration. 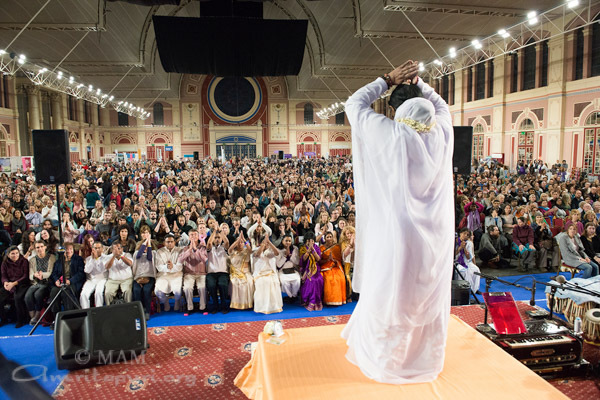 The devotees of Amma in the United Kingdom also presented a beautiful ‘Ras Garba’dance of Gujarat to the accompaniment of Amma’s bhajans. 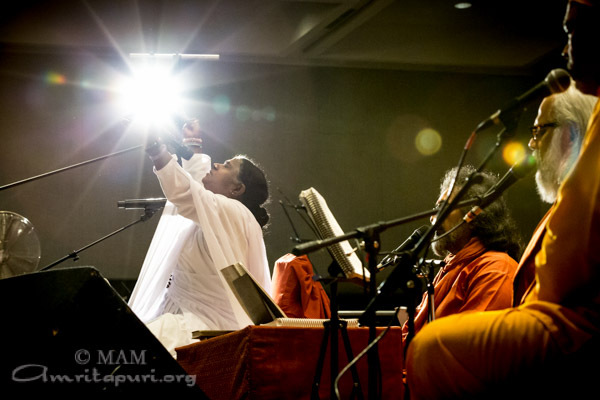 The stage was lit with lights for the Diwali celebration, and Amma reminded Her children, “Just like these lamps lit on the stage, if we can light the lamp of faith and love in our hearts and walk forward together, then we definitely can dispel the darkness that we see around and bring about a change in society. 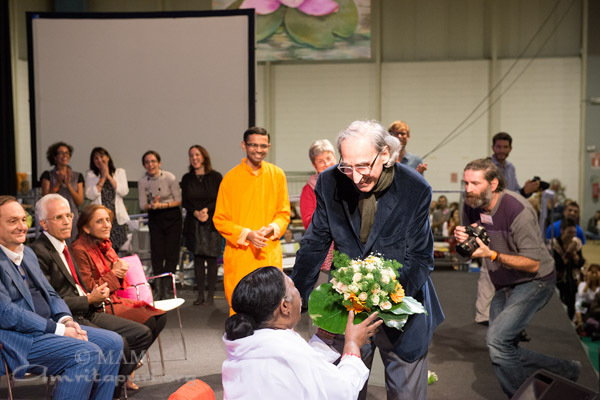 Swami Poornamritananda was invited as a guest speaker at the Bali International Interfaith Youth Program 2015. 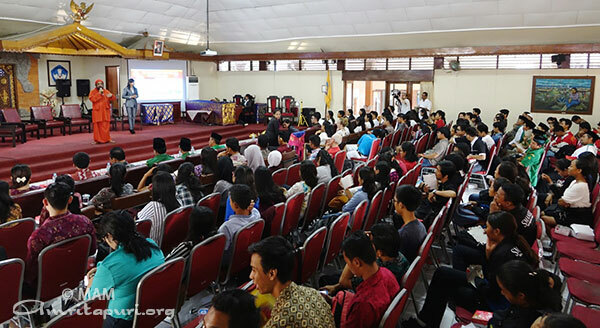 This was the 3rd interfaith program held in Bali. 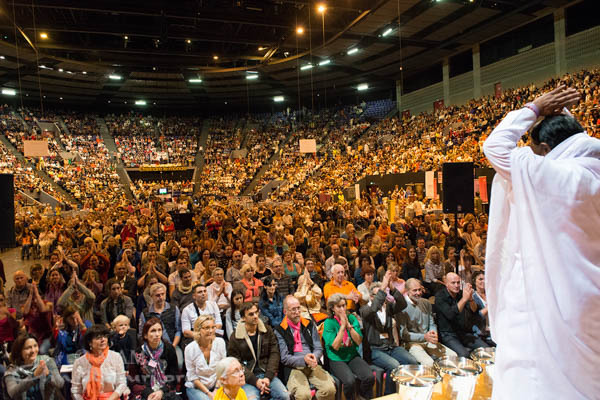 Representatives from many religions spoke on this occassion. 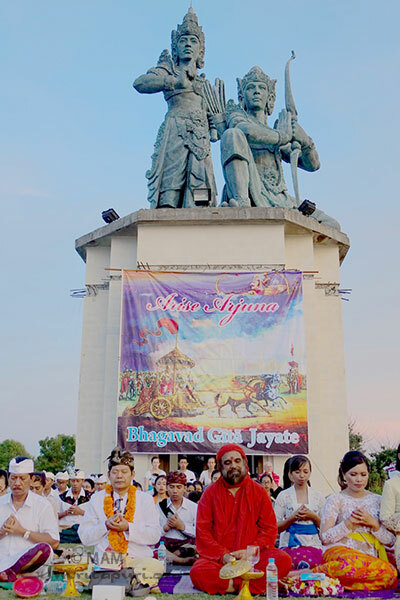 Bali is well known for its religious tolerance and is known as the Island of the Gods and the Island of Tolerance. 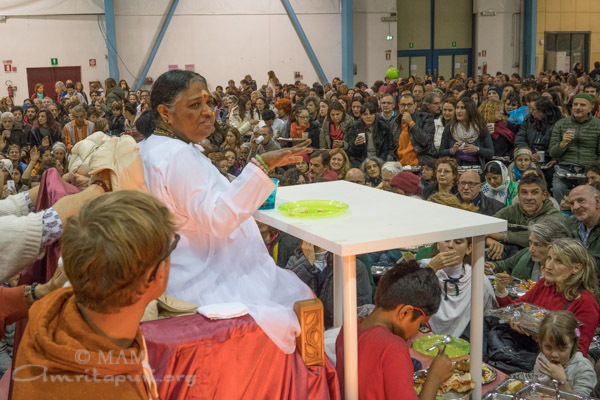 A beautiful spring-like weather welcomed Amma for 3 days at Busto Arsizio, the small town located 30 km North of city of Milan, where Amma holds her programs since 2012, when she visits Italy. 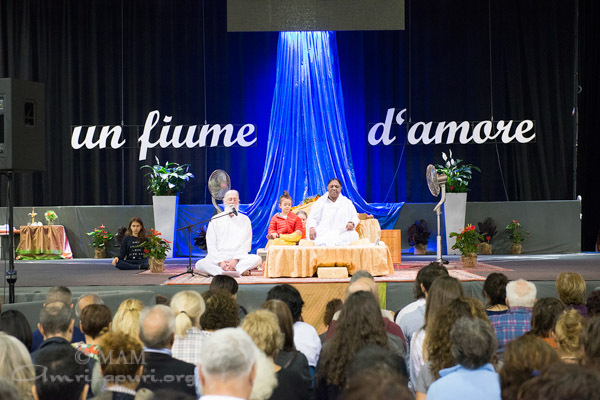 The very pleasant sunny and warm weather encouraged devotees and interested people from all the parts of Europe to come to the programs with warm and happy hearts. 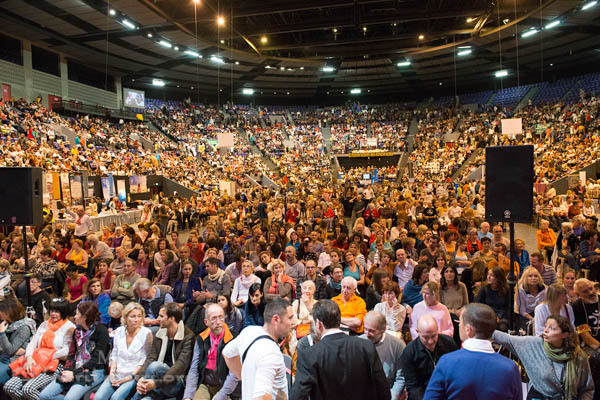 Large crowds filled the many connected halls at the MalpensaFiere site, and outside. 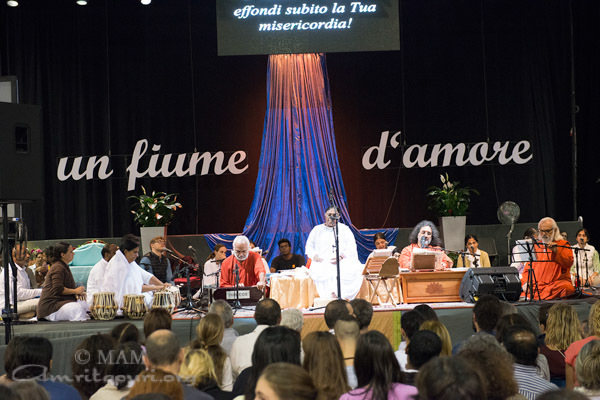 Welcoming Amma were the Mayor of Busto Arsizio, Gianluigi Farioli, His Excellency Mr Basant K Gupta, the Ambassador of India in Italy, and the very famous Italian singer and composer Maestro Franco Battiato. 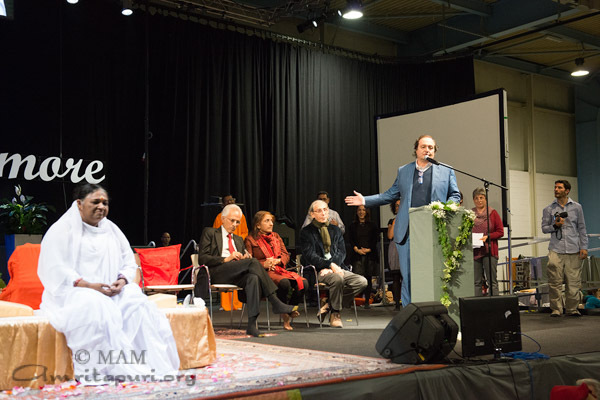 Notable presences at the programs were those of film director Anna Agnelli, daughter of Umberto Agnelli, and Tracy Chaplin the grandson of the legendary Charlie Chaplin. 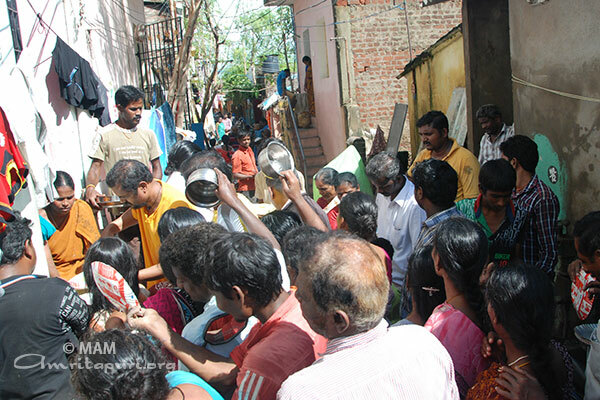 Amma’s visit enjoyed a large media coverage. 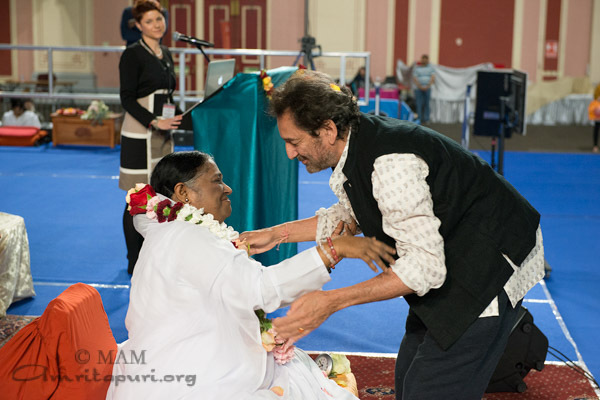 Rai TV interviewed Amma during darshan. 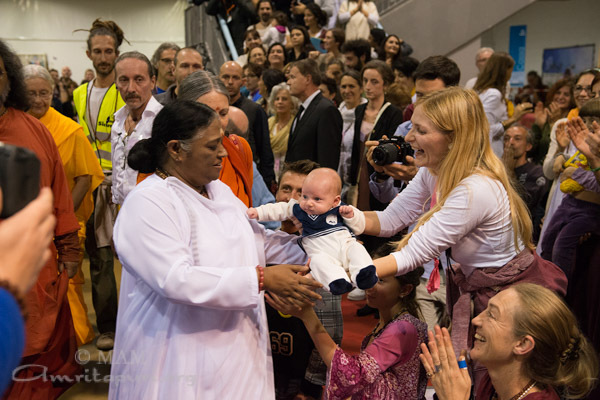 Journalists from the Corriere della Sera also had the opportunity to interview Amma extensively on the last day of the programs. 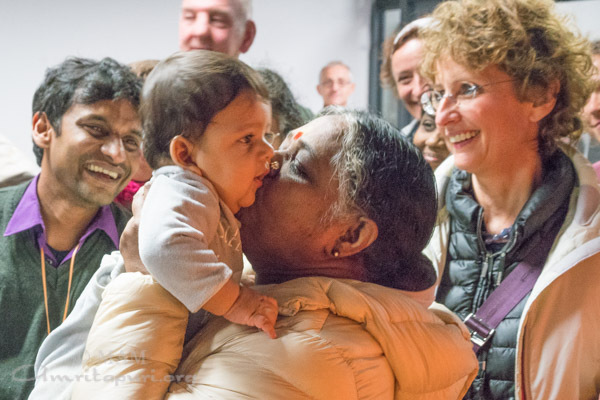 On the evening of the 5th, Brahmachari Shubamrita Chaitanya was hosted at the famous radio station ‘Radio Deejay’by the very popular quirky media personality La Pina, during her daily program ‘Pinocchio’, which runs at the peak evening rush hours. 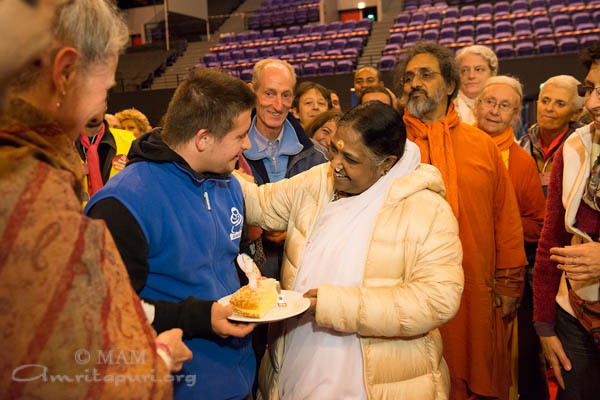 La Pina came for Amma’s darshan on the next day, and was charmed by Amma’s presence and loving energy. 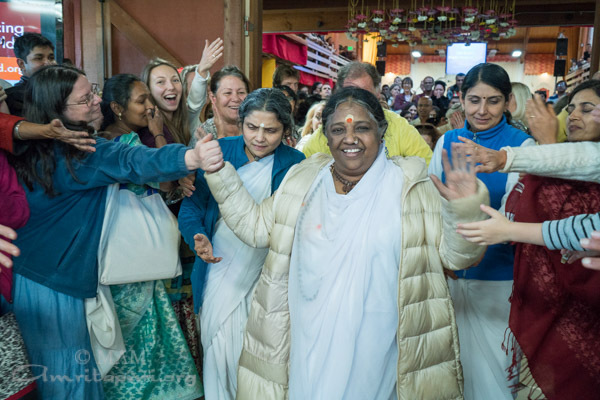 When Amma ended the Devi Bhava at 10.30am on Monday 9th November, the hall was still full of devotees eager to get more and more of Amma’s blessings. 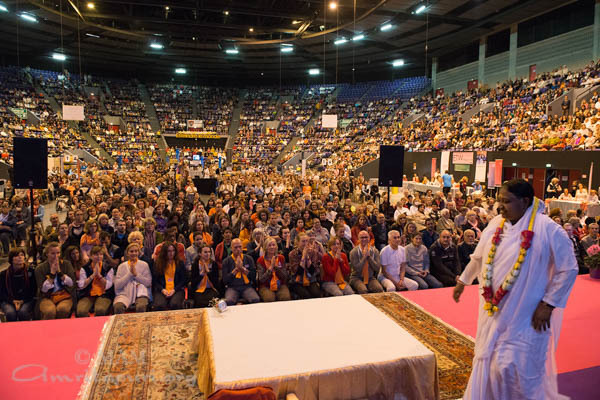 Scenes from the Zenith Omega arena in Toulon, Southern France. 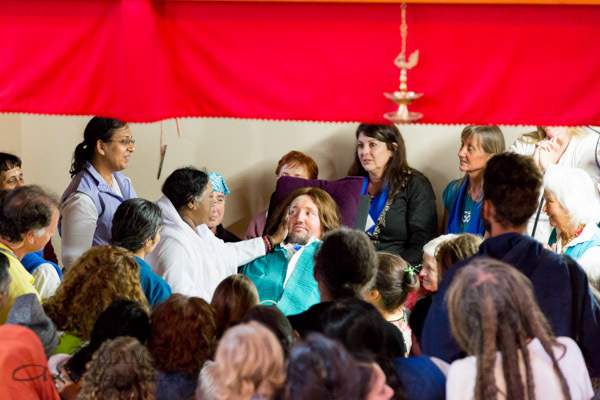 For three days and nights, the packed stadium was transformed into a temple of hope, love and light as tens of thousands passed through Amma’s arms, meditated together and prayed in unison as one heart and one mind for world peace.